Can't keep your health care plan? Received a cancellation letter? We know that ObamaCare is causing this happen to people all across America — your family, your friends, your co-workers, your employees. Maybe even you. Washington needs to see what is happening. That's why Independent Women's Voice launched a new Tumblr site -- MyCancellation.com -- and we are looking for submissions from the millions across the country who have received cancellation letters from their health insurance providers notifying them that their plan - that they liked - will be cancelled due to ObamaCare. Help us show Washington the faces of those who were told they could keep their plan if they liked it, who really can't. All thanks to ObamaCare. The Tumblr site is asking anyone anyone who has received a cancellation message to submit it to [email protected]. From the hundreds of submitted letters, many include information about their new plans or new premiums under ObamaCare, which in most cases are extremely more expensive. 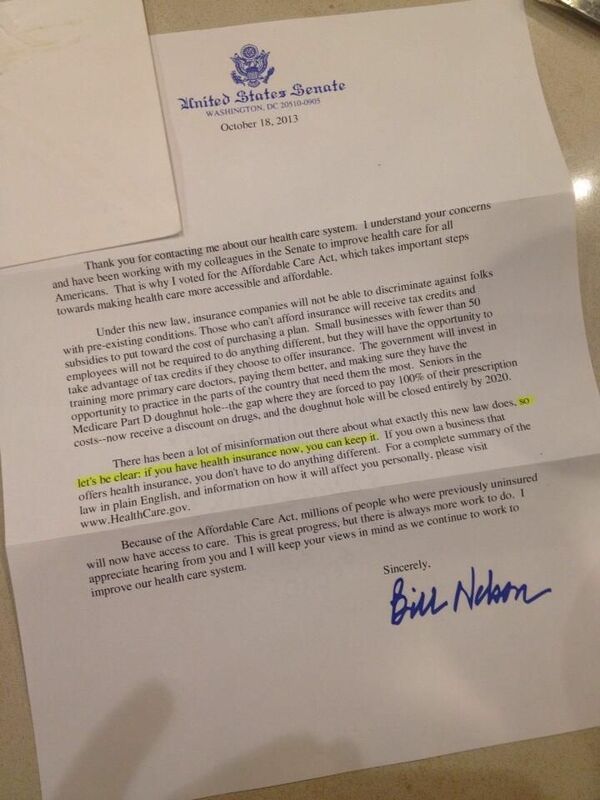 So far, some politicians refuse to the see damage being done across the nation and some have made the same exact promises as President Obama (on October 18 Senator Bill Nelson reiterated Obama’s recurrent broken insurance promise in writing). The claim that Obamacare would let Americans keep existing plans if they liked them is false and now President Obama is lying about his lies. It’s time to tell the truth. Let Washington see the faces of all the people who are paying the price. Our Twitter handle @MyCancellation, which now has over 8,000 followers, was suspended three times since its’ inception last Friday. We did not engage in spam behavior, we didn’t violate any of Twitters rules and we followed their suggested “best practices.” Could we have been knocked down by the White House Twitter amry? Someone must be worried. Twitter’s response to the suspension appeal: It looks like a disproportionately large number of users, including ones you followed or @replied, have chosen to either block your account or report it as spam. MyCancellation.com, a project of the Independent Women’s Voice, was created to highlight the real-life stories of people who are suffering because of ObamaCare. Independent Women's Voice is a 501(c)(4) nonpartisan, nonprofit organization for mainstream women, men and families dedicated to promoting limited government, free markets, and personal responsibility. IWV is an affiliate organization of the Independent Women's Forum.